The GSMA recently announced details of the 2017 Mobile World Congress. It’s going to be big, it’s going to be bold, and once again it’s going to be in Barcelona. The congress will bring together professionals from the mobile and associated industries in one exciting, innovative and huge exhibition. How huge, exactly? According to their August 2nd press release and following on from 2016’s impressive numbers, the GSMA is expecting over 101,000 delegates to attend. Even for a city that’s used to plenty of visitors, that’s a lot of people to accommodate. If you’re planning to attend MWC 2017, it’s essential to get your accommodation booked well in advance. 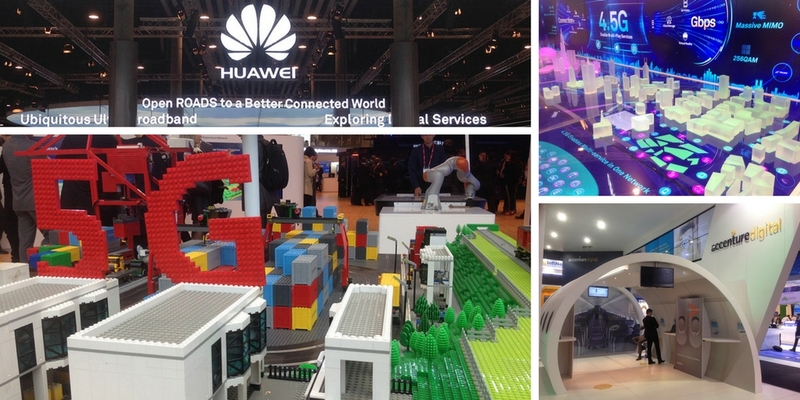 Barcelona Solutions is the premier provider for Mobile World Congress delegates. We know Barcelona, we know the MWC, and we specialise in meeting the needs of MWC delegates – including accommodation, airport transfers, transport, venue hire and event management. You want to get on with participating in one of the largest mobile events of its kind. Our job is to let you do just that. Barcelona Solutions are dedicated to taking the hassle out of finding the perfect accommodation for you and your party. With our extensive local knowledge, we can place you at the best accommodation in the best locations. And our solutions go well beyond finding the best hotel or apartment. 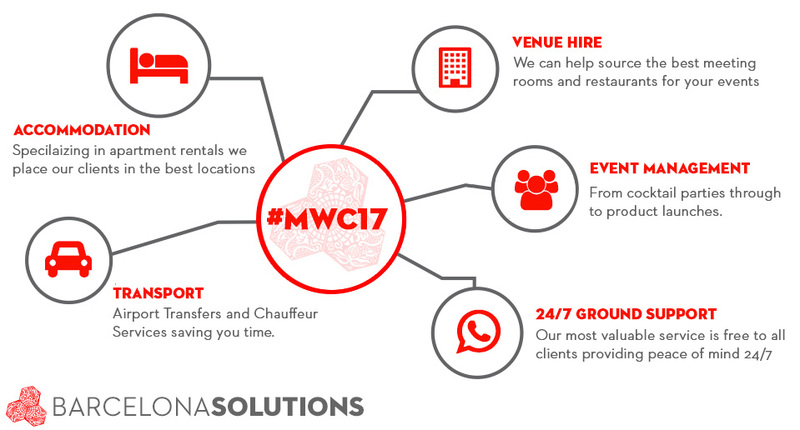 In fact, we offer a seamless end-to-end service for your 2017 MWC visit. Whether you need reliable airport transfer, chauffeur-driven transport, venue hire or events managed, just tell us what you want, and we’ll do the rest. Our expert account managers are waiting to take your call now. The congress will take place from 27th February – 3rd March 2017. It’s principally located at the Fira Barcelona Gran Via Conference Centre, with additional events being held at the Fira Montjuïc Exhibition Centre. All the leading players from within the mobile sector will be exhibiting, as well as those with substantive involvement in mobile technology. Around 2,200 companies will exhibit. For two years running, the congress has been the largest carbon-neutral trade shows in the world, and 2017 will continue with the same environmental commitment. Four Years From Now (4YFN), a platform aimed at serving the needs of technology entrepreneurs. Led by internationally-recognised experts, there will be keynote addresses, interactive discussions, workshops and one-to-one meetings to support those involved in technology start-ups. The Graphene Pavilion, demonstrating the applications of this incredible material that is set to transform the mobile industry. The Internet of Things (IoT) pavilion, exploring how smart technology is starting to connect everything from domestic cookers to entire cities. Innovation City, where attendees can experience the next stage of the mobile revolution through exciting demonstrations and hands-on experiences. Tours of the event tailored to the needs of specific attendees. With such a vast amount to cover, tours can allow visitors to focus on just those aspects of the congress that are of the greatest interest. In 2016, for example, tours that looked at 5G, Internet of Things and mobile media. 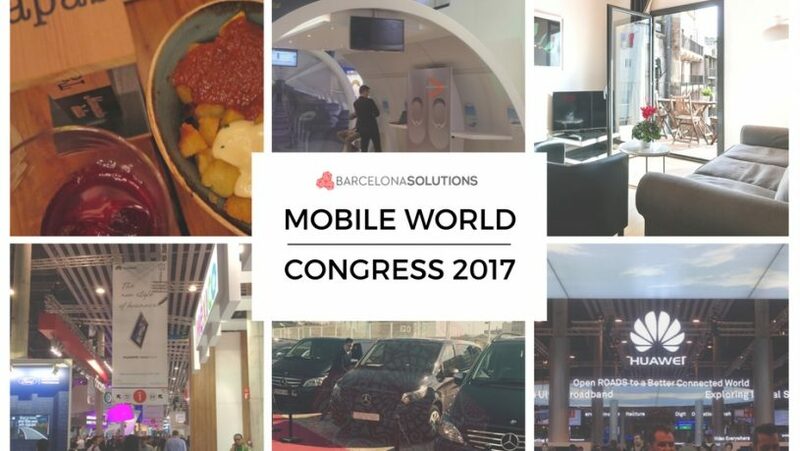 If you’re in the mobile or associated industry, the 2017 Mobile World Congress is going to be a key event. It represents incredible opportunities for learning, getting new ideas, promoting your services and networking. In sheer scale alone, the 2017 congress is set to surpass even last year’s amazing figures. Make sure you get the most out of this golden opportunity. Let us work our magic on your accommodation and local transport needs, so that you can focus on the important business. Get in touch today and find out how we can support you throughout the Mobile World Congress 2017. Note: Comments on the web site reflect the views of their authors, and not necessarily the views of Barcelona Solutions. Requested to refrain from insults, swearing and vulgar expression. We reserve the right to delete any comment without notice explanations.